The Walking Dead developer Tweets once, just once, and half the Twitterverse screams "Bigby!" Telltale Games, which made itself extremely popular last year with its Walking Dead adaptation, has a new title in the works. How do we know this? Because Telltale Tweeted just one word: #Howl. A word which might have incredible significance for fans of a certain fairytale-inspired Vertigo monthly. There's no way to know for sure at this stage what Telltale has in its secret box, kept safe in the trunk of its anonymous sedan. Telltale has said it won't reveal anything until a certain convention ... a convention at which, at 3pm in the Boring Panel Room, Saturday 23rd March, it's going to give the faithful a first look at the Fables game it's been working on. Visuals will be on offer, and tales will be told, but if you want to know exactly what's coming, you'll have to be in the room. 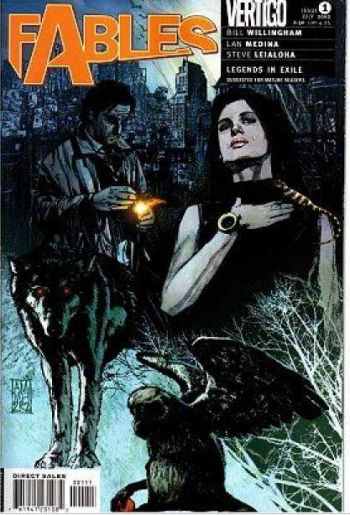 The #Howl may refer to Bigby - the Big Bad Wolf - one of the main characters in the Fables universe. Fables takes the likes of Snow White and Cinderella into a modern New York setting, in which those characters which can pass for normal try to live amongst the humans, while those who can't live upstate, far from prying eyes, on the Farm. It's got a noir crossed with Grimm feel; Bigsby, for example, starts the story as the Sheriff of Fabletown, though he's since given that job up, and used to double as detective and enforcer of Fabletown's rules. His kids are gods-in-training, he's the son of the North Wind ... it all gets pretty complicated, to be honest, so it's probably just as well that Telltale has the job of turning it into a game. Telltale doesn't mind complicated; in fact, it thrives on it.